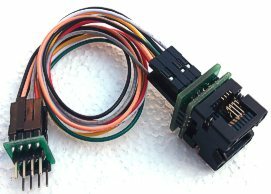 This adapter set has flexibility for any chip pin out SOIC8 to DIP conversion. 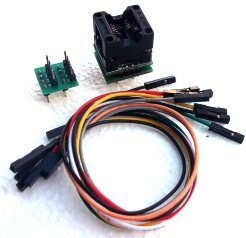 It can be used on special SOIC8 pin out. Such as M35080, BR9010F, BR9020F,BR9040F etc. It also can be used on reversed pinout SOIC8 chip for remapping to a non-reversed pinout DIP8 pinout. It comes with a ADP-004, ADP-067 and connection jumper wires needed. It works on GQ True USB series programmers.